As an integrated communications provider, Adam Phones provides services to many different kinds of businesses, as well as very important individuals. Adam Phones have a lot to shout about in terms of their successes. Well trusted in the Financial Sector for providing a fully-rounded, compliant service package, they often use Hedge Fund Magazine as one of their main advertising outlets – the only issue is how to stand out against a sea of other providers shouting about their products? Their largest challenge being how to tackle content, with so many great things to say and services to provide, Adam Phones often suffered from trying to fit too much into their full page adverts. 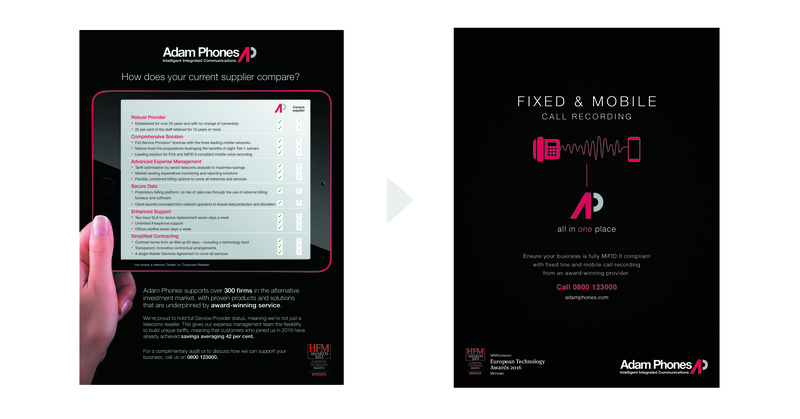 Convincing a client that less is more is a difficult thing, but to give them the edge over their competitors and really let their personality and confidence shine through Adam Phones rose to the challenge and saw the benefits as their Mobile Voice Recording campaign gained a record number of conversions.